Now summer is about to arrive and during summer there are many foods that should be eaten more and some should be eaten less. 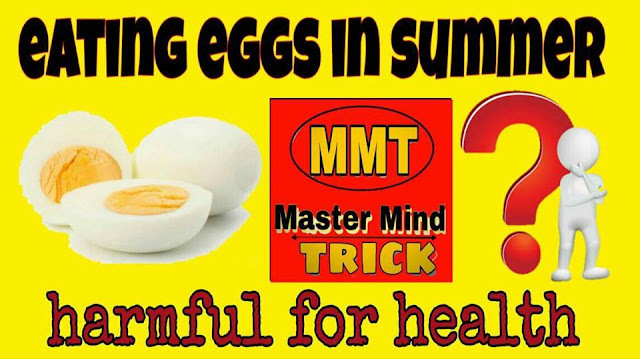 People often recommend that eating eggs in the summer should be avoided because the egg is heated and it does more harm than the benefits in the summer. While eggs have many health benefits and this is a good source of protein. Along with this, vitamin A, vitamin D and other types of nutrients are found in it. So what exactly are the eggs good for your health during the summer? Diet expert Neha Sanvalka says that it is a misconception of people that eggs should not be eaten in summer. Yes, the egg is naturally hot but it is also a complete meal. It is rich in various vitamins and minerals like calcium, iron, and phosphorus. It is commonly believed that eating eggs during the summer increases the problem of indigestion, but it is also not true. Indeed eggs can help you deal with heat in summer. Since they are rich in many nutrients, they help maintain fluid balance in the body, which is very important during the summer. Eggs keep your energy at a high level and help prevent fatigue and weakness in the heat. Doctor Neha Sanvalka says that it is okay for you to eat one or two eggs daily during the summer, but eating more eggs than it can be harmful to you. The bodybuilders or those who are trying to build muscle, they eat four to six eggs every day. But they should take only 2-3 eggs per day during the summer. Since eggs produce heat, eating them more can cause stomach upset. Doctor Neha Sanawalka says that during the summer, you can eat eggs in any form. The best option is that you consume boiled eggs. Because boiled eggs are slightly healthier than fried eggs. Should you eat eggs every day? You might have heard many people say that eating more eggs increases the amount of cholesterol in the blood. At the same time, some people believe that eating an egg every day keeps the body strong and there is no bad effect on your body. But it is important to know the truth with logic. It is true that cholesterol in the egg is in huge quantity. An egg contains about 200 MLS of cholesterol. But if you take 350 ml of cholesterol in the amount of food you eat in the day, then eating an egg is a much better option. According to a research, diseases related to heart and arteries can be reduced by egg intake because it contains good amounts of cholesterol, which helps in the removal of waste cholesterol in the blood vessels of the body. Acal protein and zinc etc. are obtained from this intake. The best thing to eat eggs is that it is the easiest to cook and you can cook it every day, consuming 6-7 eggs a week does not harm, but the body gets plenty of proteins and energy, At the same time, the problem of bladder pressure is also removed. If you have a heart problem, you eat four eggs a week. Just keep these cooking methods a little healthier. They are better than deep frying, soak it with salt and eat it. So now - Sunday or Monday, Eat eggs every day.